We hope to see you in 2018 for new exhibitions, lectures, musical events, and gallery renovations. Illumination of the Liturgy of the Eucharist. 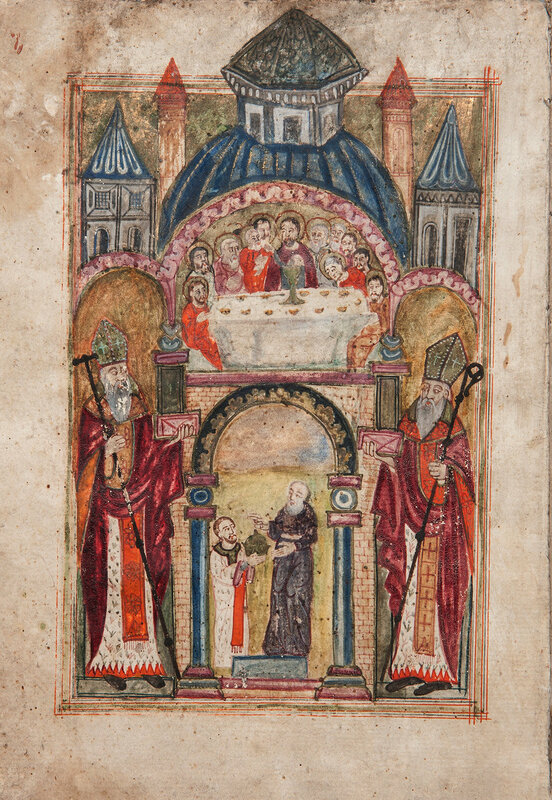 Hand-copied in AD 1711 by Yeghia Marsvantsi Elijah of Marsvan. Donated to the Armenian Museum by Adele and Haig Der Manuelian. GIVE THE GIFT OF ART AND CULTURE! Giving to the Armenian Museum is a gift of art and culture this holiday season. It shows that you value the commitment the Museum is making to display and create conversations around the long and complex history of Armenia. You can give to the General Museum Fund or the Children’s Program Fund or join or give a Membership to a friend or family member. Membership and Giving provides a full year of privileged access to our galleries, invitations to lectures, openings, and musical events, and provides discounts at the Museum shop and for Studio Class tuition. Give a donation and/or purchase a gift membership online at armenianmuseum.org, over the phone by calling (617) 926.2562, or stop by at 65 Main Street, Watertown, MA 02472, Thursday – Sunday, 12-6 pm.